Showcase #31 (Mar 1961) - The Sea Beasts from One Billion B.C. A stolen invention allows a crook to control giant devolved fish that terrorize the oceans. Aqua-Exclamations: Great Whirlpools! Shades of Davy Jones! Shiver my Timbers! Great Catfish! Well, I'll be a Starfish! Great Waves! Leaping Sea Lions! Great Sea Shells! Suffering Sea Snails! Great Guppies! Captured/Knocked Out report: Aquaman is driven out of Cook's hiding place by fish controlled by Cook. Then Aquaman's whole army turns on him when Cook devolves them. In fact, Aquaman spends a lot of time rescuing people instead of fighting the bad guy. Quotefile: "Shades of Davy Jones! I've been sailing the oceans for nigh on 30 years -- and this is the first time I've ever seen 'em!" Officer on a cargo ship, referring to Aquaman and Aqualad. Finny Friends Report: Aquaman and Aqualad are riding porpoises. Aquaman uses whales' spouts to board the cargo ship, and octopi act as extra propellers to get the ship away from the sea monster. Aquaman has the fish search for John Cook, and a "pop-eyed porgy" finds his hideout. 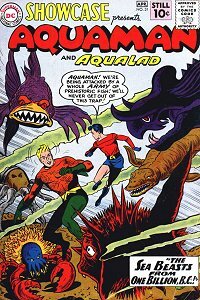 Aquaman has an army of fish attack the hideout, but Cook devolves them and sets them to attack Aquaman and Aqualad. During Cook's reign of terror, Aquaman rescues people with whales, sea turtles, and dolphins. Luminous fish help obscure Cook's attack light, allowing Aquaman and Aqualad to reach him. Manta rays and dolphins help survivors of the future fish attacks. Aquaman draws off the future fish with a flock of sea gulls, getting them in range of the military guns. Aquaman and many other fish then disrupt the aim of those guns. Another solid long story in Aquaman's tryout issues of Showcase. There is no story decompression in this one, just a lot of different actions leading into each other one after another. Each part of the story had its own cliffhanger, and they all fit together. I loved the designs of the "prehistoric" as well as the future fish. The blowfish managed to be cute even as a giant monster threatening everyone. And again, we get the notion that an assistant to a scientist in the DC Universe is a good gig to get if you want to turn criminal and make a lot of money before getting nailed by the super-heroes. You would think they would just focus on being scientists instead, since they must have some serious skills to be a trusted assistant on some of those projects.